Think about how you use data when working with math: The data appears as a list of numbers or text. MATLAB uses a similar viewpoint. It also works with lists of numbers and text that you create through various methods. The information is stored as a list of two numbers. Each number is treated as a separate value. 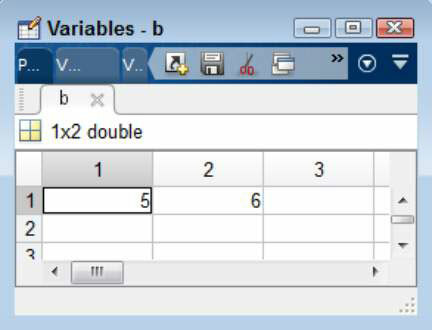 Double-click b in the Workspace window and you see two separate entries. Notice that the Workspace window shows b as a 1 x 2 list in which the entries flow horizontally. You can type format compact and press Enter to save display space. If you want to clear space in the Command window for typing additional commands, type clc and press Enter. The information is stored as a list of two numbers. However, the arrangement of the numbers differs. 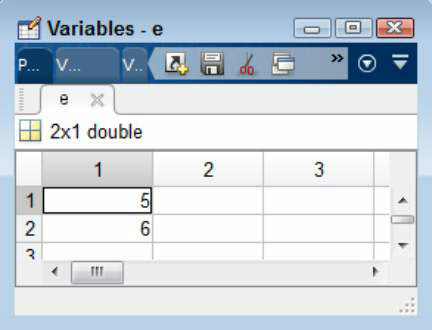 Double-click e in the Workspace window and you see two separate entries. Notice that the Workspace window shows e as a 2 x 1 list in which the entries flow vertically. There’s an easier method for obtaining the size of a numeric list easier method. Right-click the Workspace window column list and select Size from the context menu. You may also find it helpful to display the minimum and maximum values for each entry. This information comes in handy when working with large vectors or matrices where the minimum and maximum values aren’t obvious. To obtain this information, choose Columns→Min, and then choose Columns→Max. Typing each value in a list manually would be time-consuming and error-prone because you’d eventually get bored doing it. Fortunately, you can use the colon (:) to enter ranges of numbers in MATLAB. The number on the left side of the colon specifies the start of the range, and the number on the right side of the colon specifies the end of the range. Using the colon to create ranges has a problem. MATLAB assumes that the step is 1. However, you may want the numbers separated by some other value. For example, you might want to see 11 values between the range of 5 and 10, instead of just 6. In this case, the step value is 0.5. Each number is 0.5 higher than the last, and there are 11 values in the output. The range is from 5 to 10. In short, using linspace() is a little more flexible than using the colon, but using the colon requires less typing and is easier to remember. This is precisely the same output as that of the linspace() example. However, when using this method, you specify the step directly, so you don’t control the number of values you receive as output. When using the linspace() approach, you specify the number of values you receive as output, but MATLAB computes the step value for you. When you look at the Workspace window, you see that g is a 1 x 11 vector, while h is an 11 x 1 vector. The first entry is a row vector and the second is a column vector.